When you think of North Carolina, do you think of snow? Of course not, but if you have been watching the news, crazy weather has been happening all over the place. I thought when moving to N.C. that I could put the snow shovel away, but as of today, that didn't happen. We got about an inch and a half of beautiful white stuff. Being a native New Yorker, out of habit I got out the shovel and salt and got to work, but the joke was on me. Apparently, it wasn't necessary and many of my NC friends filled me in after the fact that it would melt rather quickly. Apparently I am supposed to go sledding and make a snowman. The funny part of the snow situation is that for the last eight years, any time my husband goes away on business in the beginning of the year, we always have a huge snowstorm and I was the one always shoveling. It's always a great workout, but I still think it is a conspiracy. Being at home I had time to get started on some projects, deep condition my hair and was able to watch some cooking shows I normally don't get to see. I was watching Pioneer Woman while running on the treadmill and she made comfort foods for one. That was perfect since I was a party of one and there was beautiful snow on the ground. 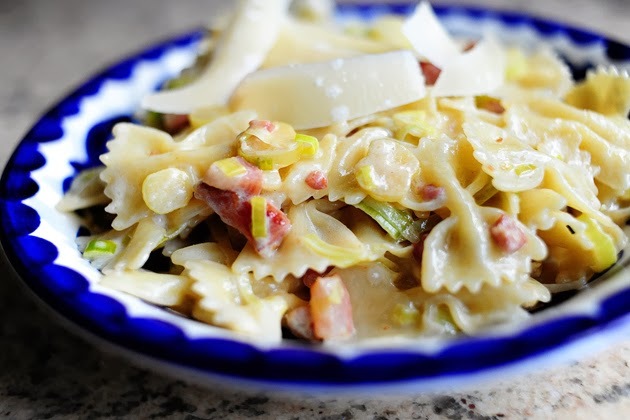 The Pioneer Woman, Ree, made Pasta with Pancetta and Leek. The recipe is simple and I was lucky enough to have all the ingredients in the fridge and the pantry. The only things one might not have is a leek and the pancetta. I used regular bacon instead of the pancetta because that was what was on hand. I made this meal and scarfed it up so quickly that I didn't have time to take a picture. It was so quick and delicious that I wanted to share it with you. Few things are better than sitting on your couch with a glass of wine, fire going, bowl of delicious cheesy pasta with bacon, and snow on the ground. Even if you don't have snow, try this recipe, you won't be disappointed.